Outdoor flooring options on the market today are endless, and the number of choices overwhelming. After narrowing down the choice to Travertine for our patio project, we decided to use pavers instead of tiles. Why? Let’s discuss. So what exactly are the major differences between tiles and pavers? One of the biggest differences between Travertine tile and Travertine pavers is the thickness of the material. Tiles are typically 1/2″ thick, while pavers are much thicker, ranging from 1 1/4 – 2″ in thickness. Travertine tiles are typically used indoors and have very square edges. On the other hand, pavers can have a chiseled or tumbled edge and can be installed outdoors using sand and gravel versus the typical grout application of tiles. Natural stones, such as Marble and Travertine, commonly come in dimensions of 8″ x 8″, 8″ x 16″, 16″ x 16″, and 16″ x 24″. The above picture depicts the “Versailles” or “French” pattern using the 4 different sized tiles. My friend used Travertine tiles for her pool patio. If using Travertine outdoors, pavers are recommend, due to the thickness. These pavers were laid in the Versailles pattern as well. Tumbled pavers are a perfect choice for a pool and hot tub patio. Tumbled pavers are rough-hewn to prevent slips and falls in wet areas, and come with coordinating pool coping and edging options. Plus, Travertine pavers won’t react with pool chemicals or allow mold growth in a pool setting. Other friends of ours also chose Travertine pavers for their outdoor pool and patio project. Using the popular Versailles pattern, this patio is complemented by stacked stone columns, steps, and a hot tub. An additional seating area and pergola are set off in the distance, also using Travertine pavers. 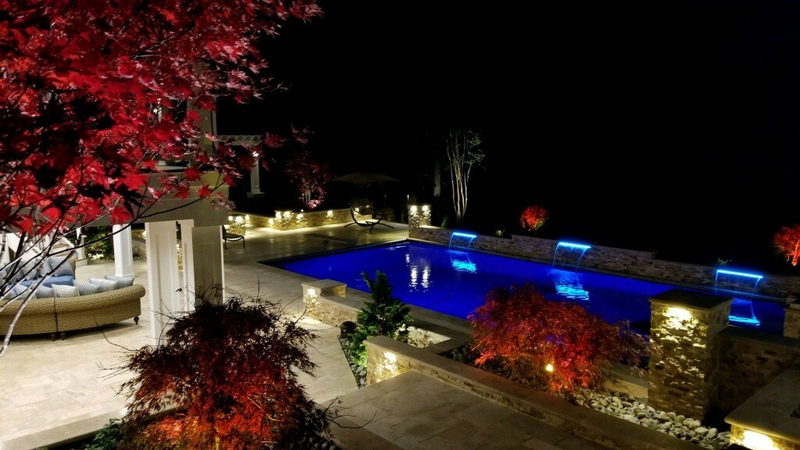 A nighttime view of this to-die-for-pool and patio space. We considered using Marble for our patio but ultimately decided against it. We knew Travertine was the right stone for the project. One reason that I was considering Marble, were the color choices. With the color tones of our house (and future color tones :)), I knew I wanted something other than brown. Most of the Travertine stones I looked at had brown tones while the Marble ones had white tones. I wanted a whiter paver but in Travertine not Marble. In Five Changes to Completely Transform any Room – Our Basement Renovation and Remodel Ideas, we chose to use Marble tiles on our flooring. In our prior home, we removed carpet and installed Marble stones to finish our basement floors. Marble is absolutely beautiful. The space is 1600 square feet and we used brushed/chiseled tiles, 1/2″ thickness. While finding the right color was a bit tricky, I eventually found what I was looking for, in both color and size. After waiting 6 months for the stones to arrive from Turkey, we finally received nine palettes of Travertine pavers. This was a special order due to the size of the pavers. As I mentioned earlier, these stones are typically stocked in the 8″ pattern, which consists of 4 sizes; 8″ x 8″, 8″ x 16″, 16″ x 16″, and 16″x 24″. We chose paver sizes that are not commonly stocked, and are in a 12″ pattern. They come in 4 sizes as well but much larger; 12″ x 12″, 12″ x 24″, 24″ x 24″, and 24″ x 36″. The color is more silver than brown and can be also be laid in a similar pattern to Versailles. The thickness of the pavers is 1 1/4″ as opposed to the 1/2″ thick tiles used indoors. It’s important to note the difference between indoor and outdoor stones, thicker stones should be used outdoors! Outdoor thicker stones/pavers will be more durable than indoor thinner stones/tiles, so remember to ask and shop for outdoor pavers when deciding on your next patio or pool project. Lastly, Travertine can either be dry-set (laid in a bed of sand) or mud-set (set in mortar on top of a concrete slab). We chose to mud-set our pavers on a concrete slab, but it is more common to lay them in a bed of sand. The advantage to dry-set installation is that it allows you to replace a paver easily if it becomes damaged, and it’s a lot less expensive. The process is a bit trickier if the stones are mud-set, but we feel the pavers are more secure and there will be less movement being set on concrete but this option is more costly. For more outdoor improvement projects, please subscribe to Happy Haute Home and follow along on Pinterest HERE, and Twitter HERE and feel free to pin and tweet your favorite pics from Happy Haute Home! You can also get daily home decor inspiration by following along on Instagram HERE. If you use any of my tips and suggestions, tag me on Instagram, I would love to see it! I do too Lynn! It’s such a beautiful stone and feels so welcoming and warm. So many colors to choose from too. The project is coming along nicely, should be completed soon! Hugs! !